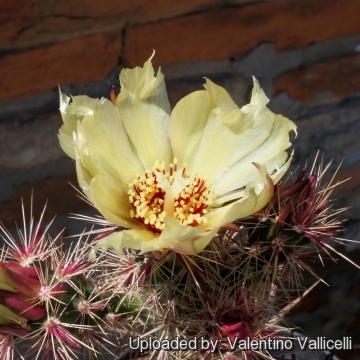 Origin and Habitat: Grusonia invicta (Corynopuntia invicta) . Vizcaíno Desert Region to just north of the Cape Region. Central Baja California, Mexico. This species is fairly common and there are definitely more than 10,000 mature individuals. Altitude range: from sea level to 200 metres above sea level. Habitat: This species grows in silty, sandy, or gravelly soil at low elevation near the coast in Sarcocaul shrubland. 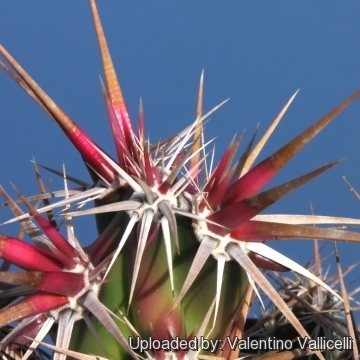 In some part of its range it grows among Echinocereus brandegeei and Echinocereus hancockii this three species look remarkably like one to each other. The adaptive value of this convergence (if any) is unknown. It is a widespread and abundant species with no threats. 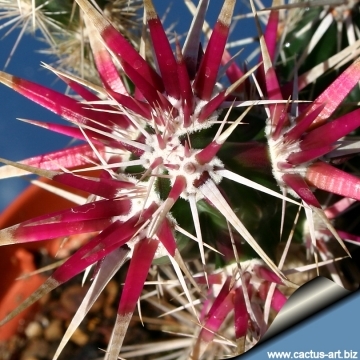 It is extremely spiny and very hardy. 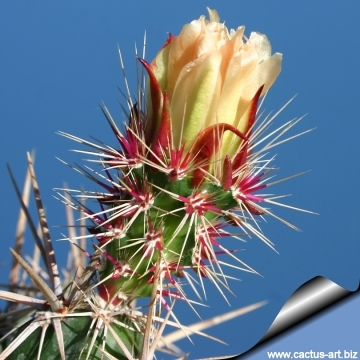 Description: Grusonia invicta (Corynopuntia invicta) is a mat forming cactus that grows approximately 20-50 cm high and up to 2 m across (or more) with stout stems and very broad formidable spines. Stems: Jointed, deep green ascending or spreading. Segments obovoid to club-shaped, up to 12 cm long. Strongly tuberculate. Tubercles: Large, flattened laterally, 3-4 cm long. Areoles: Large up to 1,5 cm in diameter with white wool. Glochids: Few white up to 4 mm long. Leaves: Linear, slightly curved, reddish and ephemeral, 8-14 mm long. 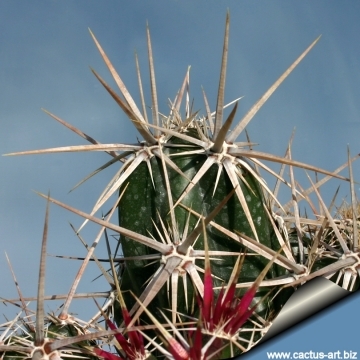 Spines: Thick, sharp-pointed, straight and strongly flattened, that look like little daggers, 1-5 cm long, and are at first reddish or purple with bright carmine-red base, turning greyish-white and finally black. 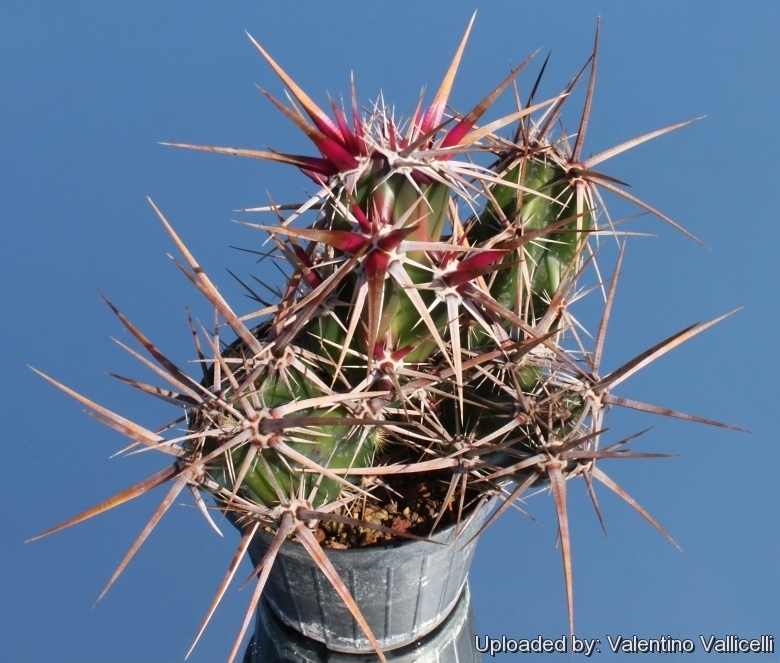 Central spines: 10-12 much stouter than the radials. Flowers: Yellow up to 5 cm in diameter, with a magnificent form. Tepals ovate-acuminate. Ovary almost hidden by numerous reddish acicular spines. Blooming season: April to May. Seeds: Yellowish, 2 mm broad. 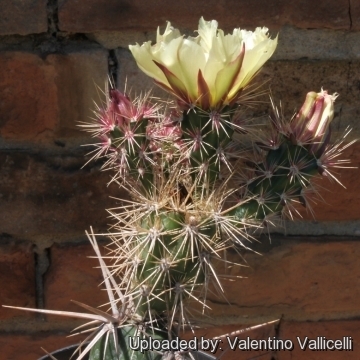 Notes: This species strongly resemble in habit with Echinocereus brandegeei and Echinocereus hancockii and do not suggest in the remotest degree any of the other Opuntia. 6) Baker, M. & Puente, R. 2013. 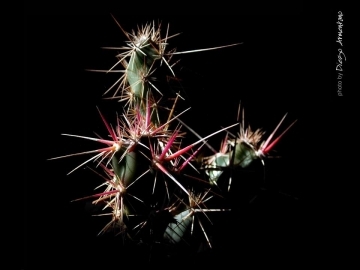 Corynopuntia invicta. The IUCN Red List of Threatened Species 2013: e.T152904A693102. http://dx.doi.org/10.2305/IUCN.UK.2013-1.RLTS.T152904A693102.en. Downloaded on 16 March 2016. 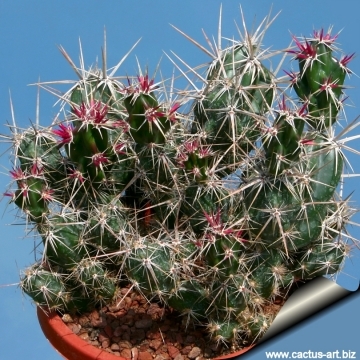 Cultivation and Propagation: This plant from Baja California needs warmer winter temperatures, and can resist only occasional light frost, above -2 C. It is very sensitive to over-watering (rot prone) and needs good drainage. Fertilize with a half-strength liquid fertilizer in summer. Irrigate regularly during the growing season, keep absolutely dry in winter. Needs full sun. Propagation: Seeds or herbaceous stem cuttings (Allow cut surface to callus over before planting).